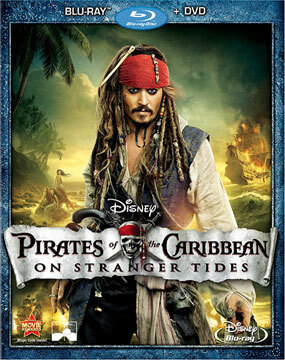 Pirates of the Caribbean: On Stranger Tides Blu-ray and DVD Detailed. Walt Disney Studios Home Entertainment has revealed full details and cover artwork for the action adventure ‘Pirates of the Caribbean: On Stranger Tides’ on DVD and Blu-ray. ‘Pirates of the Caribbean: On Stranger Tides’, which stars Johnny Depp, Penelope Cruz, Ian McShane and Geoffrey Rush, will be available to own on Blu-ray/DVD 2-Disc Combo Pack, Blu-ray 3D Limited Edition 5-Disc Combo Pack, Blu-ray 15-Disc Four Movie Collection and Movie Download. Special features include Disney Second Screen, Bloopers, Deleted and Extended Scenes and Audio Commentary by director Rob Marshall. In the film, Captain Jack Sparrow crosses paths with a woman (Cruz) from his past, and he’s not sure if it’s love—or if she’s a ruthless con artist who’s using him to find the fabled Fountain of Youth. MPAA Rating: (PG-13) for intense sequences of action/adventure violence, some frightening images, sensuality and innuendo. “Pirates of the Caribbean: On Stranger Tides” captures the fun, adventure and humor that ignited the hit franchise —this time in Disney Digital 3D™. In this action-packed tale of truth, betrayal, youth and demise, Captain Jack Sparrow crosses paths with a woman from his past (Penelope Cruz), and he’s not sure if it’s love—or if she’s a ruthless con artist who’s using him to find the fabled Fountain of Youth. When she forces him aboard the Queen Anne’s Revenge, the ship of the formidable pirate Blackbeard (Ian McShane), Jack finds himself on an unexpected adventure in which he doesn’t know who to fear more: Blackbeard or the woman from his past. ‘Pirates of the Caribbean: On Stranger Tides’, ‘Pirates of the Caribbean: On Stranger Tides in Disney Digital 3D’ and ‘Pirates of the Caribbean: On Stranger Tides An IMAX 3D Experience’ in theaters May 20, 2011.